Burrishoole Dominican friary, Co. Mayo. This structure at Ross Errilly Franciscan friary, near Headford, Co. Galway, is locally known as 'Burke's Castle'. It has also been incorrectly referred to as the 'Abbot's House'. Ross Errilly itself has often been called 'Ross Abbey', a misnomer, as this Franciscan house did not have an abbot. 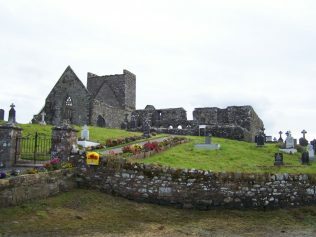 Rosserk friary, located along the shores of Killala Bay in north Mayo. 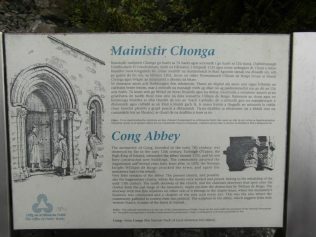 Signage from Cong Abbey, Co. Mayo. As a house of the Augustinian Canons, this can correctly be called an abbey. 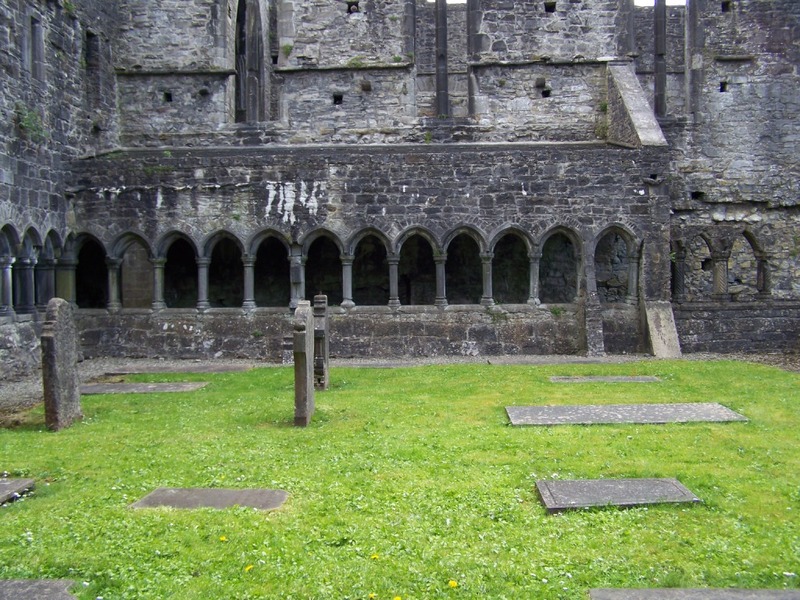 Cloister of Cong Abbey, Co. Mayo. 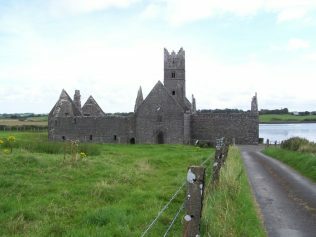 This abbey was built in the School of the West style, a transitional style between Romanesque and Gothic that occurred west of the Shannon. 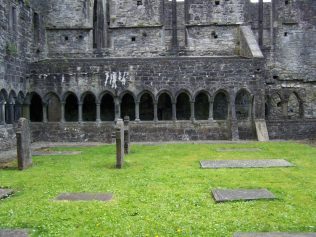 Cloister of Sligo Dominican friary, built in the Gothic style. As part of the Dominican order in which the office of prior existed, this house can correctly be called a friary or priory. 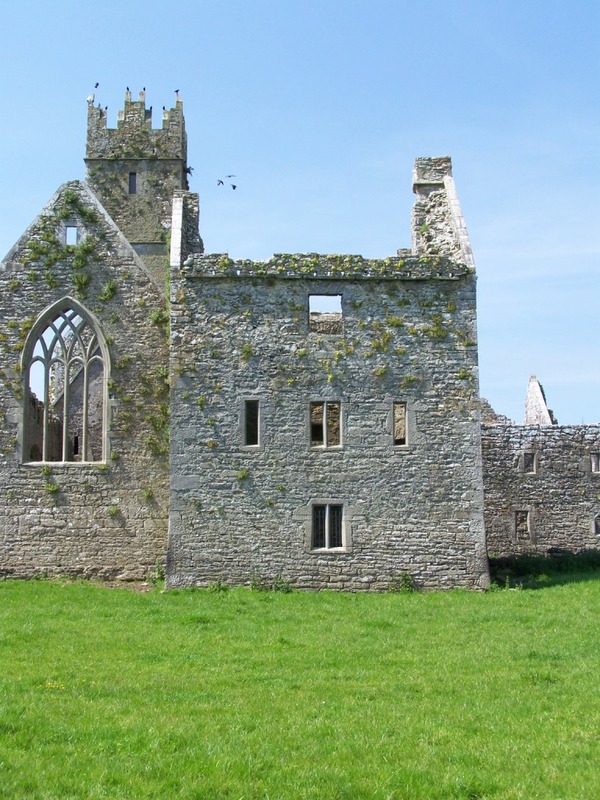 Visitors to medieval Irish religious houses could be forgiven for detecting an identity crisis afflicting many of the houses of mendicant orders in Ireland. The mendicant orders are those orders who committed themselves to a life of poverty, supported by begging for alms. In medieval Ireland, there were four principal mendicant orders: the Franciscans, Dominicans, Augustinians and Carmelites. There were also the Friars of the Sack who only established a single house in Ireland and proved to be relatively short-lived as an order. 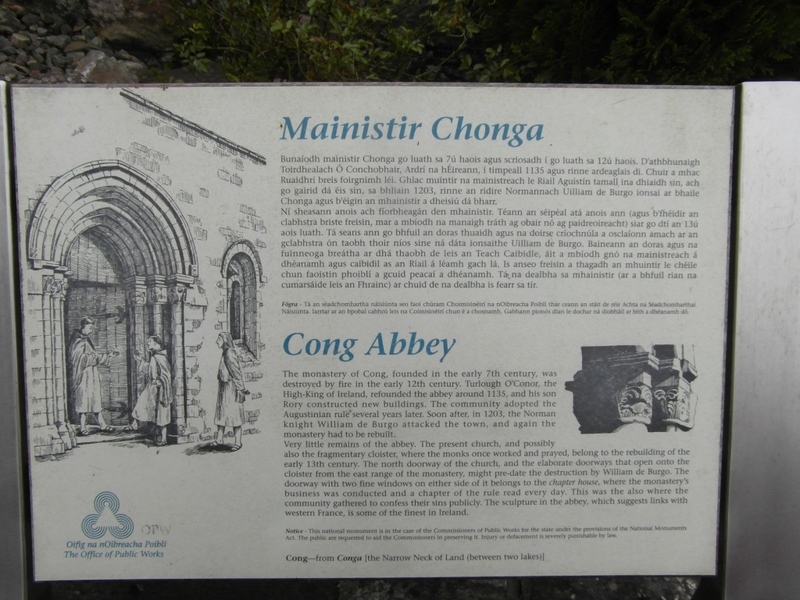 Houses of the mendicant orders in Ireland are frequently referred to, popularly, on maps and on signage as abbeys. However, this is inaccurate. Abbeys have abbots: an office that does not exist in the mendicant orders. Non-mendicant orders, such as the Benedictines and Cistercians had the office of abbot, to which one was appointed for life. The mendicant orders took a different approach to the leadership of individual houses. The Dominicans, for example, elected a prior, a post of three years duration, a fixed term contract, if you will. In the Franciscans, the comparable post of provincial was also a temporary one. The prior or provincial would be responsible for the running of their convent for the duration of their tenure and would then return to being a friar again. The rationale behind the temporary nature of such appointments was that office holder’s actions would hopefully be informed by the knowledge that once their term was up, they would return to being an ordinary friar. Thus the humility which was at the core of the mendicant orders’ guiding principles should be maintained. The power held by a prior, provincial or abbot was considerable and could have the potential to corrupt. For the mendicants, it was envisaged that this potential could be moderated by the fixed term nature of a friar’s tenure as leader. So, what then should religious houses be called? Houses of the Cistercians, should as at Boyle, Baltinglass and Corcomroe can correctly be called abbeys. Houses of the Augustinian canons (as distinct from the Augustinian friars, discussed above) can also be called abbeys. 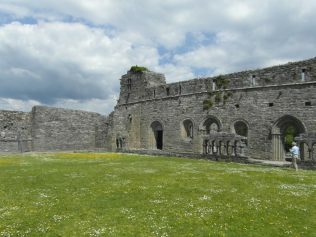 Examples include Ballintubber abbey and Cong abbey, both located in Co. Mayo. 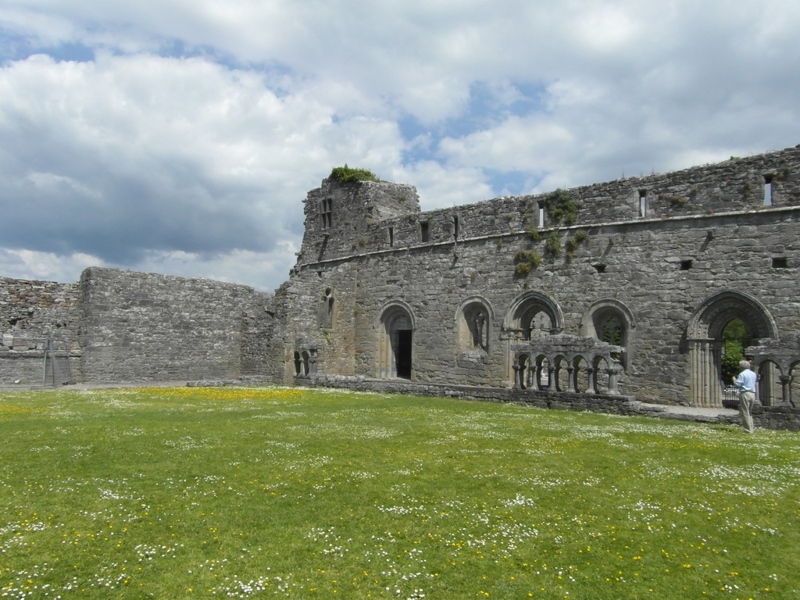 The term friary can be used to refer to houses of the mendicant orders, such as Rosserk Franciscan friary, Burrishoole Dominican friary and Murrisk Augustinian friary, all in Co. Mayo. It is also correct to use the term priory to refer to houses of those orders in which the office of prior existed, such as the Dominicans. Ó Clabaigh, C. (2012). The Friars in Ireland, 1224-1540. Dublin, Four Courts Press.